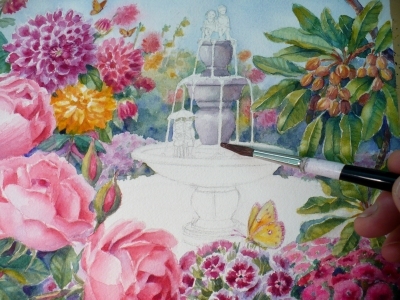 Now that the flowers are finished, it's time to start on the fountain and path. If you missed the preceding demos, you can find them here: Part 1, Part 2. I begin with some washes of gray made by mixing a cool red, blue and a tiny bit of yellow. The water that is flowing from the basins, I have left white. 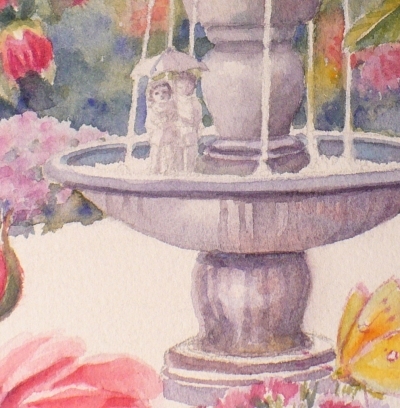 The figures of the children are painted the same as the fountain. Since the sunlight is coming from the left, I create shadows on the right side with my gray mixture. 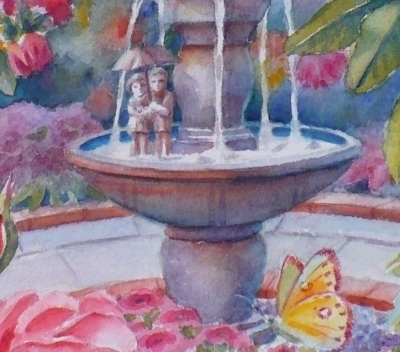 The water in the fountain does not take much paint to make it look real. 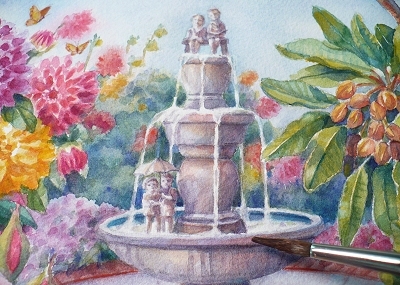 Below, you can see that I only had to add a few light gray tones here and there to give it a flowing, churning look. 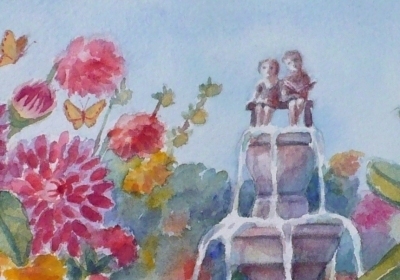 Once the fountain and both sets of children are done, I paint the stones and bricks of the path. 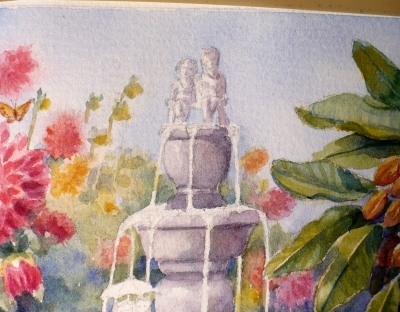 I also add some washes of red on the fountain and figures to warm them up. I paint a cool blue wet-into-wet in the shadow areas. This part takes the longest. When a painting is almost done, that is almost always the case. Each part of the painting has to work with every other part which means tweaking the light and dark, the colors and the details. This can take many glazes of color with drying time in between each one. And below is the finished painting! 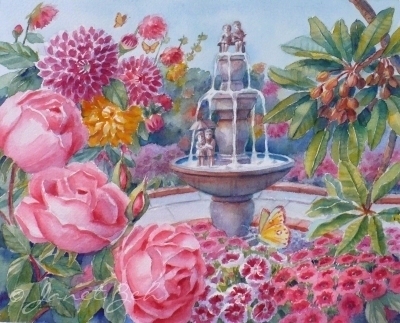 Now you can stroll along the garden path and enjoy the flowers on a beautiful summer day. I hope you enjoyed this watercolor demonstration. The grandmother who receives this as a gift will have her four grandchildren to remember when looking at it: Dahlia, Rose, William and Shea.